remain, with continued monetary accommodation supporting moderate growth amid mild inflation in most of the developed and principal emerging markets economies. But the rhetoric and actions on trade between the US and China, now scheduled to affect $100 billion in overall trade flows, threaten to upend the calm and productive backdrop of renewed optimism after a long, slow post-Great Recession recovery that has had market observers predicting a lower-for-longer malaise that recalls the late 1970s. Perhaps the VIX volatility index offers the most instructive indicator of the current market disarray in what seemed to be developing into a smooth, comfortable easing into a higher return, lower risk environment propelled by tax cuts and cushioned by central bank liquidity. Since the late 2016 US presidential election, the VIX seemed muffled by enormous asset purchases that in some countries has even included equities, but it has recently spiked and headed back toward long-term averages (see chart below). The recent equity market selloff reflects considerable uncertainty prompted by the announced US tariffs and China's retaliatory actions. Will the two economic behemoths engage in a gradual stand-down, or is an escalation in store? Without meaningful precedent and absent the likelihood that multilateral intervention by the WTO can make any difference, we have shifted to a slightly more cautious stance on global equities. Below, we review effects of tariffs, recent Fed action and statements, and the increasingly important blockchain technology. In light of greater uncertainty, the LISI Investment Committee voted at its late March meeting to reduce equity exposure modestly and reallocate to short-dated fixed income. Investors fear collateral damage from a fledgling bilateral trade war between the US and China. Harm could arise not only by dampening overall trade flows or pressuring global growth, but also from the ricocheting shrapnel of targeted tariffs that could disrupt specific sectors. To the extent these affect smaller, less diversified economies, broader macro implications would present themselves. Tariffs create winners and losers, but the potential interruption to supply chains introduces difficulties for purchasing and planning departments across a wide swath of industries, not just those directly affected by a specific tariff. Corporations will spend energy and concentration on contingencies and backup plans, thus diverting efforts and efficiency-building innovation and other productive activity. We believe caution is warranted as the two economic superpowers increase the stakes in these early trade skirmishes. The tariff announcements, rollbacks and exceptions that have surfaced this year introduce considerable uncertainty, which markets traditionally find difficult to embrace. This reaches across several sectors, hence the broad selloff. With this development on trade and continuing uncertainty on Fed action on rates, equity markets are down year to date (see table below). P/E ratios have declined from their December 2017 levels as valuations in the major developed markets have begun to fall toward long-term averages. Improving corporate earnings have settled price-to-earnings (P/E) ratios in the Eurozone and Japan at 15.0x and 15.8x, respectively (from 18.5x and 19.3x at mid- December). The US market has also declined, reaching 21.3x at the end of March, also below its December reading of 22.3x. We expect strong corporate earnings fueled by tax cuts to bring the P/E ratio in the US down further, not to mention any additional downturn in stock prices (see chart below). In fixed income, US Treasury yields have been rising slowly in response to the gradual rate hikes that began in December 2015 (following which the FOMC took a one-year pause). The US 10yr Treasury note nearly reached the threshold 3.0% level, after touching 2.95% in late February. The 2.2% to 2.6% range it held since the US presidential election has given way to a 2.75%-2.90% range. Comparable UK Gilts, Japanese and German Government 10-year bonds have experienced only a few basis points of yield increase (see table below). Meanwhile, fixed income risk premia have widened in the first months of 2018, and we expect that trend to continue, particularly among higher risk asset classes such as energy and emerging markets, which registered 3.8% above comparable US treasury securities at the end of March. This widening follows strong tightening in yields during most of 2017 as investors sought yield in the higher risk asset classes (see table below). At its March meeting the Fed hiked interest rates for the first time under Chairman Powell's stewardship, to a Fed funds target range of 1.50% to 1.75%, while indicating expectations for two more 0.25% interest rate increases this year. Prior to the latest market perturbations resulting from talk of a trade war, market observers concerned themselves with the possibility of four rate hikes in 2018. Futures show market expectations of 60% that the Fed hike rates another 0.25% in June, and a 1-in-5 chance of a 0.5% hike then. Notably, the canvassing of FOMC committee members that produces the median outlooks the Fed publishes shows declining US economic growth over the next couple of years, after a peak of 2.7% in 2018. The Fed expects both unemployment and inflation to remain low, and sees a Fed funds rate above 3.0% in the medium term, a marked increase from the FOMC's outlook during 2017. At the press conference after Chairman Powell's first FOMC meeting and rate hike, a reporter asked about the possibility of higher-than-predicted economic US growth, reaching 3% or higher given fiscal stimulus. To this, Chairman Powell answered first that the median estimate does not reflect the full range of views, and second, that "It would take… significant increases in productivity and labor force participation to get there." We highlighted in our March investment letter the conundrum that these two factors present, and show an updated chart again below. First, we agree with the Chairman that stagnant productivity growth accompanied by diminished labor force participation precludes higher economic growth. Labor force participation, the employed as a share of the number of working age adults, declined from about 66% in 2007 to less than 63% now. For perspective, over that time, 7.8 million people reached the retirement age of 67, while some 500,000 fewer people are working1. Second, productivity has also declined since the Great Recession (see ranges bracketed by arrows in the chart below). There is scope for tax reform and enhanced infrastructure spending to provide a Keynesian fiscal boost to economic growth, but the Fed appears to believe such an effect to be limited, perhaps because of the propensity for US corporations to spend tax windfalls on M&A, share buybacks and dividends. Additionally, protection of industries through tariffs and other anti-trade measures can depress innovation. A trade war likely limits the chance that productivity regains the ground it lost over the last decade. That leaves technological advance as the most practical way to improve productivity. Cryptocurrencies have been another victim of early 2018 market skittishness. We make no projections on which specific crypto-coin will survive or prosper. We typically tell clients who wish to invest in cryptocurrencies, ―Do it if you must, but keep it small.‖ Yes, picking the right one would be like choosing Apple in the mid-80s or the right Dot-Com company when they were flourishing. Most others are likely to fizzle. 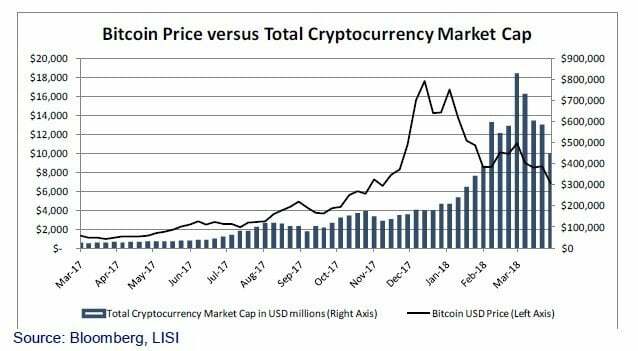 We have charted below the Bitcoin price against the market value of all cryptocurrencies; it is clear that Bitcoin has more competition and may or may not maintain its prominence in the sector. While specific coins may not matter, the technology that underlies Bitcoin and other cryptocurrencies does have the possibility to result in a significant advance in productivity (even though job losses may offset economic gains through displacement if those workers cannot otherwise find employment). The fundamental idea of a Blockchain posits that it is possible to generate trust in a decentralized system of exposed and confirmatory nodes in place of trust in a centralized repository of information (this section drawn largely from Mougayar, The Business Blockchain. New York: Wiley, 2016). In other words, the Blockchain offers a way to ―prove‖ a chain of custody that currently is provided by regulated, trusted entities like banks. For example, the status quo for demand deposits is a bank. In the US, up to $250,000 is guaranteed by the government. A client owns the account and can draw freely from it. If something goes wrong, the customer deals with the bank, that centralized repository of funds and accounts. The Blockchain differs in one important way. With a blockchain any customer can see all the transactions that exist and have ever occurred in the system. It is as if a small rural village has a central square, and in that square there is a large structure with post office boxes, one for each resident of the village. The door to each resident’s mailbox is made of glass, so that it is easy for anyone in the village to see that another resident has received a letter in their mailbox; however, they cannot see the contents of that letter. Only the owner of any particular mailbox has the key, and can open and see the contents of their letters. Further, any letter that arrives in a mailbox in the village has stamped on it a record of all other letters received in the village post office to date. That is, each letter carries the history of all previous communications, though not the actual contents. In this fashion, the Blockchain allows for multiple verifications of any transaction. In our village, if the owner of PO box 719 receives a letter intended for PO Box 315, the owners of all the PO boxes will see the mistake because all of them will have the full history of all transactions that occur. The great potential for Blockchain technology in business resides in the potential to disintermediate the current repositories of trust. Disintermediation is a term with which we already familiar: it means ―cut out the middleman,‖ and with that remove costs associated with the middleman’s services. Due to the need for trust, banks have been around a long time (Banco Monte dei Paschi di Siena, founded in 1472, is the oldest still living). But if one could trust in direct transfers of value, without the need for an institution to vouch for the sender and the transaction, then a wide system of trade, say barter but using currency, could develop. And the costs of what economists call ―friction‖ would be reduced. The applications for the Blockchain are numerous, and there are many that we might not even envision now. Mougayar notes that the invention of the Ford Model T would not predict the invention of the safety air bag. With the rise of the internet, many now commonplace uses initially did not come to mind. The world can move quickly, as we have seen in recent years. From an investing perspective, we will look for efficiencies to be derived from the implementation of Blockchain technology in some industries, and disruptive, existential cases in others. This will take time. Mougayar compares Blockchain development to that of the internet. Recall the initial resistance to internet banking before it became clear that end-to-end encryption worked. Now, banks and other financial institutions seek ways to make payments more fluid and easy. The future of the Blockchain is bright, and the disintermediation will likely produce a number of winners and, like the internet, a vastly greater number of losers. Many viewed the early February market volatility as a healthy breather from the breakneck speed with which the major equity indices reached new peaks throughout 2017. The advent of a potential trade war and its ability to disrupt planning and purchasing in the real economy could exert material downward pressure on economic growth were it to grow uncontrolled. With that caveat, the underlying foundations for the post-Great Recession economic recovery remain in place. We do not see this as time to panic. However, falling productivity and labor force participation are cause for worry given the aging US population. We do need to keep a focus on technological advances, like the Blockchain, that can serve to improve productivity.